Last year, I posted on the Perils of Online Site Reviews for the first time. The post was triggered by my then-recent discovery that the website used globally by more or less all of us to assess hotels and restaurants at the places we travel to also covers “attractions”. 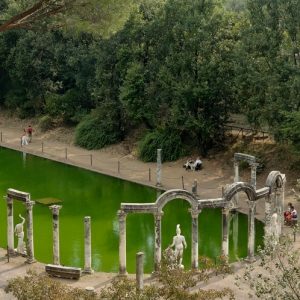 My – admittedly somewhat morbid – curiosity had led me to explore the “terrible” reviews of some of our – and our guests’ – favourites among the sites and museums we visit on our expert-led tours in Italy, Greece and Turkey. The humour – because that’s what all of this is about – resides in the sometimes astonishing disconnect between what we see, experience and share about those places and what others – apparently – see in them, or fail to see. Well, I’ve kept up with that, and there is more. Before sharing my new finds, let me offer a little caveat. Sometimes people have a bad experience of a great place and thus come up with bizarre verdicts. In some cases they are themselves to blame, for having absurd expectations, coming totally unprepared, misunderstanding everything or simply being ill-prepared to understand cultural experiences. But possibly no-one told them how to prepare, the experience was diminished by overcrowding, bad services or the weather, or they just had a bad day. Often, while certainly amused, I also think “if only you had been there with a good guide”. That said, sometimes it’s clear that nothing could have helped. So, let me proudly present another batch of bad online reviews for three more among our favourites sites, one in each country we visit, plus a fascinating bonus. Exhibit? What exhibit? 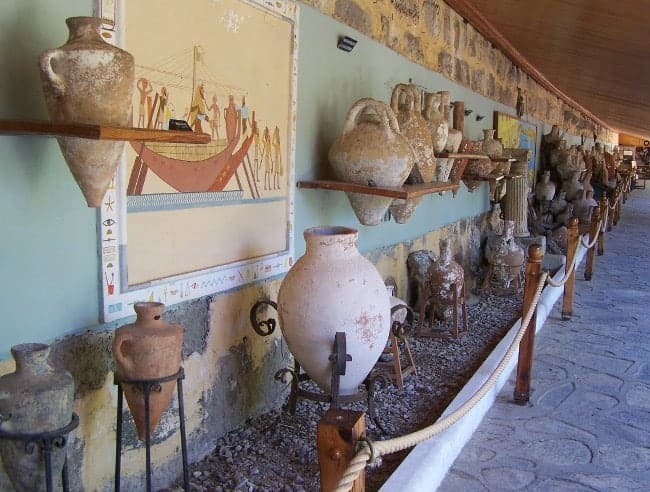 A display of over a hundred amphoras from various ancient wreck sites, that visitors pass on the way to the glass room. If they couldn’t believe it, maybe they just shouldn’t have. How this reviewer managed to get to the (very beautiful) exhibit on ancient glass without noticing the various other exhibits they must have walked by and even through – it is actually physically impossible to reach the glass exhibit without doing so – will have to remain a mystery to us, a blindfold would seem the most likely explanation, or very dense fog, or unusually distracting rodeo clowns. We love Bodrum Castle and its museum and we normally spend several hours there with our guests, showing and explaining to them both the medieval fortification and great wealth of the archaeological exhibits. Disappointing rubble: the Temple of Hera at ancient Olympia, over 25 centuries old. 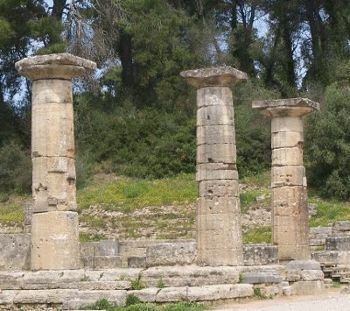 Olympia is a site of immense importance, historically, art-historically and archaeologically. This ultra-important sanctuary to the chief god Zeus, described as “pan-Hellenic” because it was a shrine respected and frequented by people from all over the ancient Greek World, is one of Greece’s flagship sites. Not only is it associated with the idea of the Olympic Games (based on the athletic contests that took place there every four years in antiquity), it is also one of the best-preserved sites of its kind, as it was abandoned in Late Antiquity and then covered in mud, preserving many of its structures in their foundations, with lower levels often preserved to a considerable height. More disappointing rubble: the Workshop of Pheidias, where the famous statue of Zeus was made in the 5th century BC, converted into a church a millennium later. (Image by Wikimedia Commons user Joanbanjo). Small mercies. The very simple and very venerable stadium, essentially the oldest in the world, is actually mostly reconstructed, but the surrounding sanctuary consists of dozens of easily recognisable buildings, most of them well over 2,000 years old, including temples, altars, training grounds, bathhouses and even an ancient hotel, not to mention the atelier of the sculptor Pheidias, one of antiquity’s most famous artists, responsible for Olympia’s great statue of Zeus, another ancient Wonder. There is a story attached to nearly every stone there, partly thanks to Pausanias. Difficulties imagining what it looked like? Even with a poor guide that won’t do: there are excellent models of the site in the site museum! Birthplace of the modern Olympics? That’s Athens. The original Olympic flame? No such thing. I can’t be sure, but these people may have had a bad guide. With Peter Sommer Travels, that won’t happen: Heinrich, Maria and Nota are all equipped to make Olympia a wonderful and insightful experience – and to outshine those rodeo clowns. The Pantheon – what can I say? One of the most celebrated buildings in the history of architecture, it was erected in the 120s (AD) as a Temple to All Gods. The circular shrine’s most striking feature is its enormous dome, then the world’s largest, hemispherical in shape and designed in such a way that its 43.3m (142ft) diameter is equal to the the distance from the open top of the dome to the Pantheon’s floor: a scheme that makes it a building based on a perfect sphere – which is probably why it is still praised today for its extraordinary sense of harmony and proportion. How did such a building survive nearly 2,000 years fully preserved? Can you guess? … the horror! 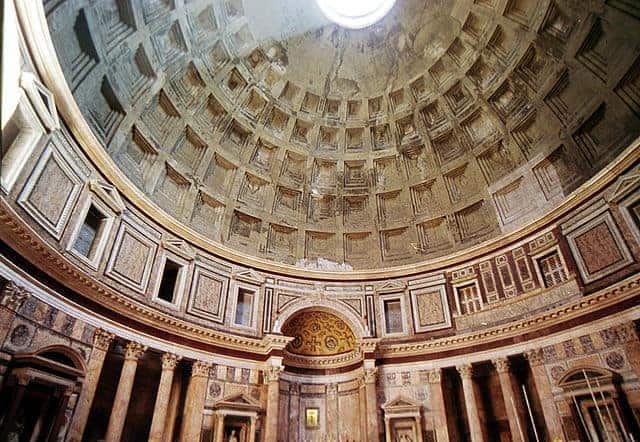 The interior of the Pantheon, one of the best-preserved Roman buildings there are. Why would anyone want to see that horror? Damn those 80 generations of Romans that have used and venerated and preserved it, so it’s still there. “Please!” We’d so much prefer if this was gone and forgotten! (Image by Nicolas Malfait). Huh? Yes, they are saying that. They somehow expected that worship of the ancient gods had survived in one building in Rome for the fifteen centuries since it has gone out of fashion. 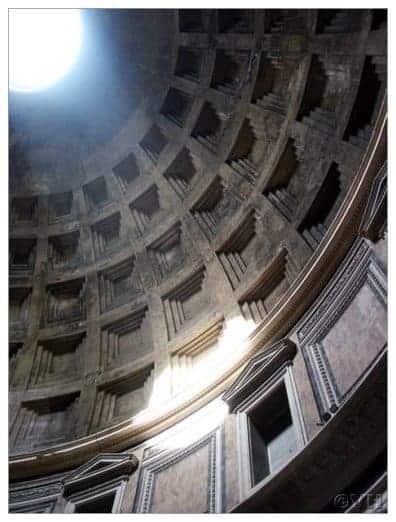 Like other great buildings, such as the Parthenon in Athens, the Temple of Athena in Syracuse and pretty much every other ancient temple that is substantially preserved, the Pantheon is so exactly because when Rome became Christian, the Romans turned it into a Christian church, dedicated to “St. Mary and the Martyrs”. Had they not done that, it would have been vandalised, demolished and quarried. The modifications inside the Pantheon are actually quite moderate, mainly in the form of added statues, altars, tombs, etc: the fine marble cladding and the wonderful coffered dome have been restored, but are essentially as they always were. Considering that the reviewer clearly indicates some prior knowledge of the building, it is all the more baffling that they were so totally unaware of its history and use. 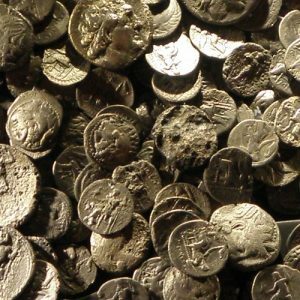 Maybe they thought that when antiquity ended, Rome – still a thriving city today – simply became a museum. Not so! Meh. The 2nd century BC Venus de Milo. If you don’t like art, why did you go to the Louvre? And why did you go twice? I guess it’s nice that you enjoyed the foyer, an underground space of queues, souvenir shops, overpriced refreshments, security checks and nothing else, a place that merely functions as a necessary prerequisite to visiting one of the world’s most important art collections – and you advise others to do the same(?!). I can’t even find a good metaphor for that: it’s like saying avoid the shopping mall, just enjoy the garage (it’s free!). 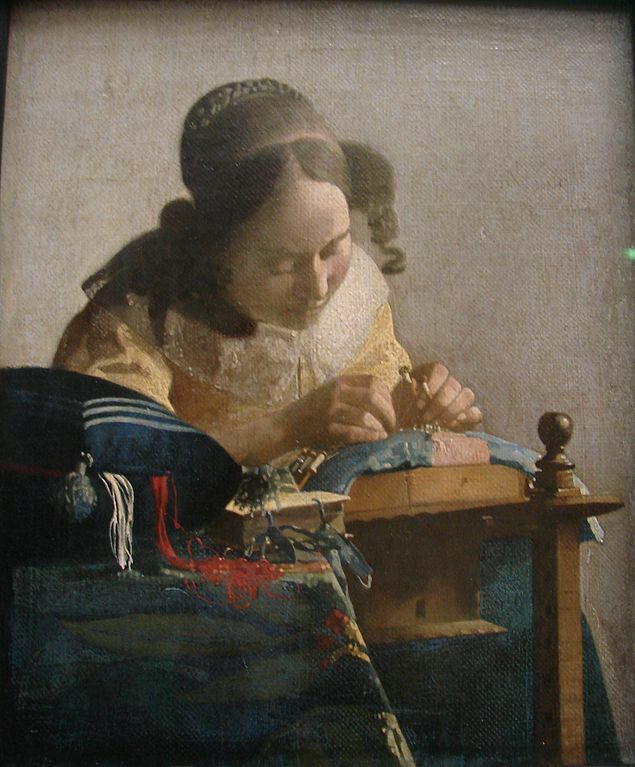 The Lacemaker, by Johannes Vermeer. Circa 1670. Louvre, Paris. Let’s be fair, why would you want to see a Vermeer? I seem to remember years gone by differently as well: there were no naked women admiring me during my mud-wrestling career, and very few babies, so they do have a point – old paintings are not the same as historical documentaries. There’s a surprise. Also, if you remember last year’s post with its review of the National Archaeological Museum in Athens starting in the line “First WE ARE NOT MUSEUM PEOPLE at all “, there may be a message here: you don’t like art? You have no curiosity to find out about it? Don’t go to an art museum, and please don’t write a review of one. Think of the children! Let’s not be cruel. This is not a lobotomy-victim, after all it is someone with the creativity to make up the word pyramidness, which may be useful for all of us. It is just a kid who had no help in taking in an enormous cultural experience. Even this contains “a tad bit” of useful information: would you have known where the real Mona Lisa is? No? Spoiler alert: Stooooopid! Joking aside, it is actually quite sad to read about people’s meaningless and misunderstood experiences of great things and places. Sure, sometimes we just can’t connect with a place and that will be disappointing. 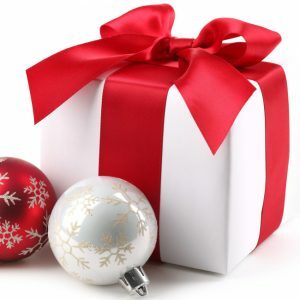 But usually, the antidote is either preparation (guidebooks, websites, anything) or going there with someone who is excited about what you are seeing and who knows how to explain it and how to help you discover it for yourself. That’s what we try to do. 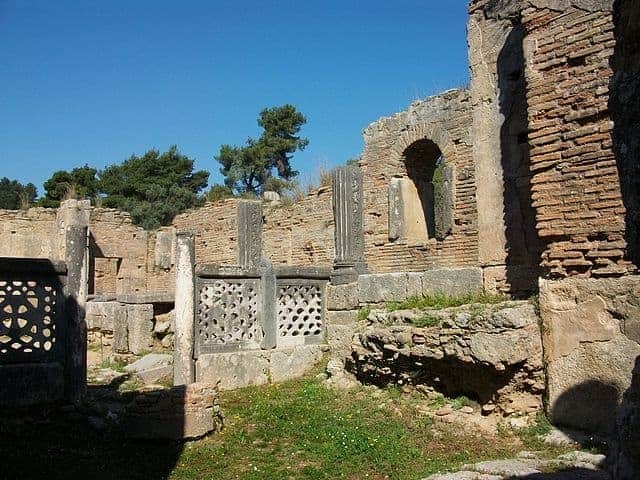 You can see Bodrum Castle and its Museum of Underwater Archaeology on many of our cruises in Turkey; Olympia is a highlight on our Peloponnese tour tour and the Pantheon has pride of place on our Rome tour. In each case, these places come alongside many other fantastic visits, some of famous sites and some of ones that are off the beaten track. We are always eager to share them with you, to show you what there is to see, and to make each visit a memorable and enjoyable experience!